Exploring on foot allows you escape the crowds and see Cambodia in a different light. At the iconic site of Angkor walk from temple to temple on jungle footpaths known to few. In the far eastern province of Mondulkiri, hike to waterfalls and tribal villages and enjoy the unique experience of a day walking with elephants. Our adventure begins in Phnom Penh, the Cambodian capital since the mid-15th century. Lying at the confluence of the Sap, Mekong and Bassac Rivers, the city is an engaging mix of tree-lined boulevards, colonial villas and vibrant markets that reflect the country's fascinating mix of ancient and colonial traditions. After a chance to settle in, this afternoon we take a leisurely introductory walking tour, beginning at the Wat Phnom temple and wandering down past the old Post Office building and Kandal market towards the riverside, where we can enjoy a drink in one of the many bars. Our walking tour today covers around 2 kilometres and is expected to take approximately one-and-a-half hours. In the morning we plan to visit the Royal Palace and the Silver Pagoda. Built by the French in 1866, this spectacular pagoda-style structure is without doubt one of Phnom Penh's most impressive sights. Our next stop is the energetic chaos of the Old Russian Market, renowned for its textiles, jewellery and antiques, it's also a good place to stop for some lunch. We then continue with a more sombre visit to the Tuol Sleng Genocide Museum and the 'Killing Fields' of Choeung Ek which are a gruesome reminder of life under the Khmer Rouge. Between 1975 and 1978 somewhere close to 17000 men, women and children were murdered here and its memorial stupa, a huge glass tower filled with human skulls, is a stark reminder of the scale of Pol Pot's atrocities. You should be aware that by their very nature Tuol Sleng and the 'Killing Fields' can be a distressing visit for some people. We set out this morning on a sort cruise on Tonle Sap and Mekong Rivers with a panoramic view of Phnom Penh along the way. Our destination is the riverine island of Koh Dach which translates as 'Silk Island' and is named after the many silk weavers who live here. Disembarking at Koh Dach market, we will take a small walking tour on the island and discover its silk weaving cottage industry, visiting artisans at work in their houses. This charming, secluded and sleepy island is small at just 30 square kilometres in size and offers a peaceful contrast to the bustle of Phnom Penh. We can enjoy some traditional Cambodian food at one of the local restaurants before catching the same boat back to the city. Departing the capital this morning we head first for the provincial capital of Kompong Cham, passing through a landscape of vast rubber plantations originally established by the French. Arriving in time for lunch, we take a walk down to the riverfront to visit the Bamboo Bridge, before continuing by road on to the 11th century sandstone temple of Wat Nokor. After a chance to explore the temple, we drive to Mondulkiri province in the far east of Cambodia. With thickly forested mountains, waterfalls and lush rolling hills, this region is one of the most sparsely populated in the country. Over 80% of the population here come from animist hill tribes with the majority being Phnong, who live off the land, still practicing shifting 'slash and burn' cultivation. They also plant rice, fruit trees, coffee, rubber and cashew nuts and hunt wild animals. Our base for the next three nights is the town of Sen Monorom, the only settlement of any note in the entire province. Today we will visit the Elephant Valley Project, a unique initiative which takes care of several herds of retired, former working elephants and rehabilitates them back into their natural habitat. We will be able to enjoy a concept the project describes as 'walking with the herd', getting up close to the elephants as they roam free in their natural habitat. We expect to accompany the elephants for five to six hours, walking across open grassland and through the forests, taking in the views across the Otey River. Accompanying the elephants to enjoy a cooling wash in a nearby waterfall is often the highlight of a visit. Today's walk, in the company of elephants, is expected to take approximately five to six hours. To the west of Sen Monorom lie the forests of Andong Kraloeng, the setting for today's walk which is the most challenging of the holiday, due to the jungle terrain and possibility of mud if it has been raining. Driving first to the village of Veal Amerik (named after the Americans based here during the Vietnam war), the trail then leads us into a forest and towards a steep hill covered in towering clumps of Sra Lao trees and strangler vines that are home to black-shanked douc monkeys, giant squirrels and great hornbills. Following lunch at the Leng Kho Waterfall, we return to Veal Amerik this afternoon and drive back to the village of Andong Kraloeng, for the chance to swim at the Leng Kao falls. We return to the hotel via the Seima Protected Forest. Today's walk is expected to take approximately three hours but can be extended depending on the wishes and abilities of the group. Today we head for the banks of the Mekong and the town of Kratie, home to a group of rare Irrawaddy dolphins. We visit nearby Koh Trong island, an extremely peaceful place where we walk and observe local village life up close, visit a pagoda and a small floating village. There's also an option to rent bicycles. Returning to Kratie in the late afternoon, there may be time to walk up the many stone steps leading to Phnom Sambok, a temple occupying a prominent hilltop to the north of the town from where we can enjoy a panoramic view over the surrounding countryside. 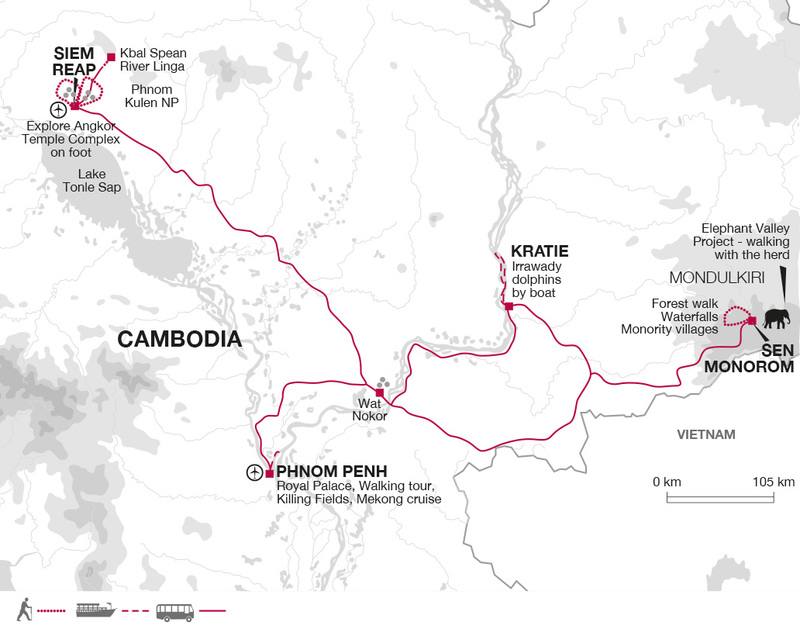 Today's walk on Koh Trong is for around two-and-a-half hours. Kratie is sprinkled with an interesting collection of old French and Khmer style buildings, but the main attraction are the dolphins. Early this morning we take to the waters of the Mekong in small boats to search for some of the last freshwater dolphins left in the Mekong. Later this morning we drive (around six hours) to the town of Siem Reap, gateway to the stunning temples of Angkor. This morning we enjoy a gently ascending walk through the shade of the forest on the south western slopes of the Kulen Hills to the riverbed carvings of Kbal Spean. The site consists of a series of 11th century stone carvings of lingams (the phallic symbol of the Hindu god Shiva) and various Hindu deities, carved into the sandstone of the riverbed and banks. It is commonly known as the 'River of a Thousand Lingas' and has a very tranquil atmosphere. Our next destination is the nearby Centre for the Conservation of Biodiversity, Cambodia's first nature conservation and endangered wildlife rescue centre where we may see a number of the mammals that inhabit Cambodia's rainforest including the Pangolin, Palm Civet and Leopard Cat. Our next Angkorian site today is the temple at Banteay Srei known for the intricacy of its pink sandstone carvings. We end the day with a visit to the Cambodian Land-mine Museum, where education and support are provided for dozens of children whose bodies, hearts and minds have been affected by land-mines. Today's walk is expected to take approximately three hours. Today we have a full day to explore the temples of Angkor on foot. Following in the footsteps of the intrepid explorers of old along jungle pathways, we will escape the tourist crowds and approach the temples with a different perspective. It's the perfect way to take in the rich archaeological majesty of the area. We begin at dawn with Ta Prohm, the exquisitely ethereal 'Tomb Raider' temple that has been part consumed by the jungle, before we move on to Ta Nei and Ta Keo, one of Angkor's great temple-mountains and one of the first built entirely of sandstone. Following jungle pathways, we negotiate our way around the fortified city of Angkor Thom and stroll along the massive stone walls towards the city's spectacular centrepiece, the Bayon. One of the architectural gems of Angkor, this maze of corridors, temples and giant stone faces is also home to some of the finest bas reliefs anywhere in the city. Today's temple to temple walking is expected to take approximately five to six hours. Early this morning we will drive to the magnificent complex of Angkor Wat, to watch the warming glow of the rising sun bring life to what is without doubt the most breathtaking of all the jungle temple sites. Entering through the east gate on foot, we then enjoy an extended visit walking around a site that covers several square kilometres. Originally built as a funerary temple for Suryavarman II, in honour of Vishnu, it represents for many the pinnacle of Khmer art and architecture and little can truly prepare you for the initial sight of this stunning setting in the early morning light. This afternoon has then been left free to continue exploring more of the temples at your leisure or you may wish to spend some time in the pleasant town of Siem Reap which has a lively market and many shopping opportunities. Our tour ends in Siem Reap after breakfast. Cambodia is a hot and tropical country, being hottest in April and coolest in January (still high 20s). Although rainfall is at its maximum in October, Phnom Penh and Siem Reap receive very little rain compared to the coastal areas, and when it does rain it tends to be in the form of sporadic mid afternoon downpours. There is normally very little rain between December and March. You will need loose fitting, comfortable clothes for hot, humid conditions. Take a warmer layer (e.g. lightweight fleece) for evenings in Sen Monorom. A sunhat, long trousers and long-sleeved shirt are essential for protection from the sun. Please dress respectfully when visiting active temples and religious sites, covering your torso, shoulders and legs to below the knee. Take a swimming costume for the jungle waterfalls and some of our hotels have swimming pools. We recommend you bring lightweight worn-in walking boots or shoes plus trainers and/or sandals for travelling and other sightseeing. Bring thick socks to wear whilst trekking in Mondulkiri as if it has rained there may be leeches. We suggest that on international flights you either carry your walking boots in your hand luggage or wear them - should your luggage be lost or delayed, your own boots are the one thing that will be irreplaceable. One main piece of baggage and a daypack. We recommend a soft holdall style bag for your main luggage as being the most practical. Bring a high factor sun cream, sunglasses, water bottle and a torch for use in power cuts and in dimly lit streets at night. Binoculars are useful for both wildlife spotting and looking at temple carvings. Accordingly please allow about US$40. In Cambodia, US$ is the most commonly used currency (small denomination notes are easier to use). There are ATMs in most towns and cities. Credit cards are accepted in some large shops and restaurants in Phnom Penh and Siem Reap. They can be hard to change outside of Siem Reap and Phnom Penh; we recommend them for emergencies only. Your simple guesthouse in Sen Monorom has en-suite shower room with hot water and air conditioning. It has no restaurant but is excellently located in the town where there is a large choice of eateries. All visa information should be confirmed with the relevant consulate. Nothing compulsory, but we recommend protection against malaria, infectious hepatitis, tetanus, typhoid, diphtheria and polio. Consult your GP regarding tablets advised for malaria. Though not compulsory, travellers may wish to immunise themselves against japanese encephalitis. Please check the latest requirements with your travel clinic or doctor prior to departure. The above is not an exhaustive list. Further information regarding vaccinations and travel health advice can be found by following the NHS and NaTHNaC links at Explore Travel Health and from your local healthcare provider. Visa and vaccination requirements are subject to change and should be confirmed by you before travelling. We walk on 7 days with walks ranging from 1.5 to 5.5 hours. Many of the walks also involve sightseeing within these timings. In Mondulkiri there is a maximum elevation gain of 300m and we walk through jungle where paths may be slippery. Elsewhere the walking terrain is flat and going is easy although you should be prepared for heat and humidity. We have graded the walking as easy.